When it’s time to celebrate a new year, Russian people do it with style! The New Year’s celebration is viewed as one of the most beloved and beautiful evenings, filled with gifts, a decorated tree, and did I mention the food… oh the food! 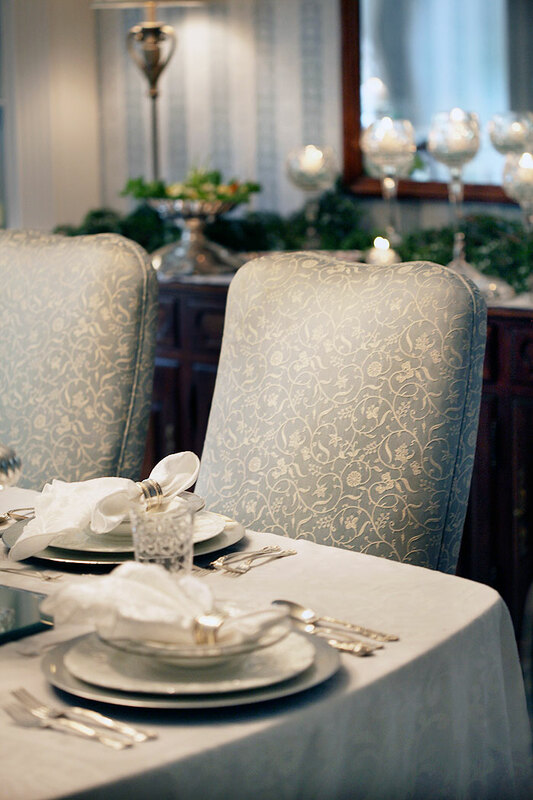 We had a chance to create a beautiful New Year’s dinner at a St. Louis home intermingling and American home and tablescape with Russian food and tradition. Kathy, our magazine stylist, designed the tablescape, in the appropriately “cool” icy blue dining room, to reflect a Russian winter with all its seasonal beauty. 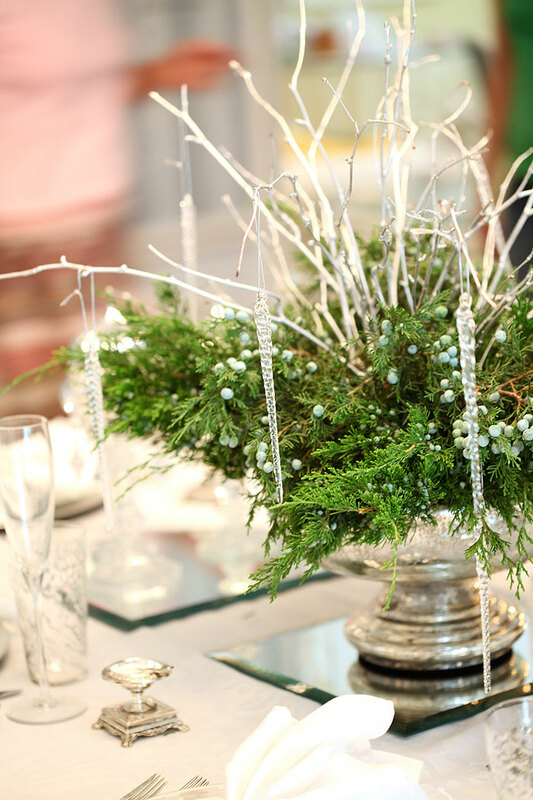 She created a Russian winter theme with sprigs of juniper arranged in a silver bowl. For an added “chill” factor, she spray-painted branches silver and adorned them with glass icicles. 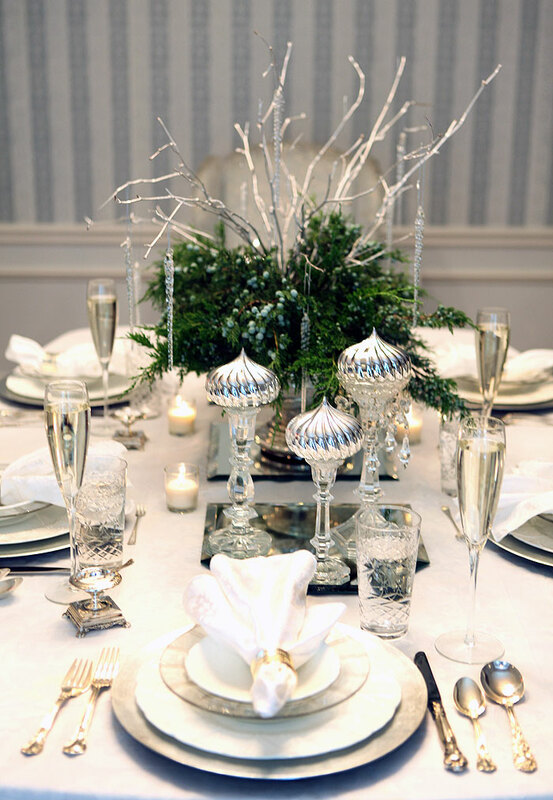 Kathy added silver round ornaments perched on silver candle holders to mimic the Onion Domes in Moscow. The rest of the table was adorned with simple white linen, white plates, and crystal. A few votives and crystal candle holders were added for a sense of warmth to this “cool” table. Traditionally, a Russian table does not have a centerpiece and is only decorated with the plethora of food that is laid out by the host. But Kathy’s decor added a touch of creativity and interest. It is no secret that Russians love to entertain. The center of any Russian home is the table and they will fit more people around that table than you could ever imagine… especially during a New Year’s celebration! Since entertaining is woven into the framework of Russian culture, it does not necessitate a special occasion to gather the whole family together. 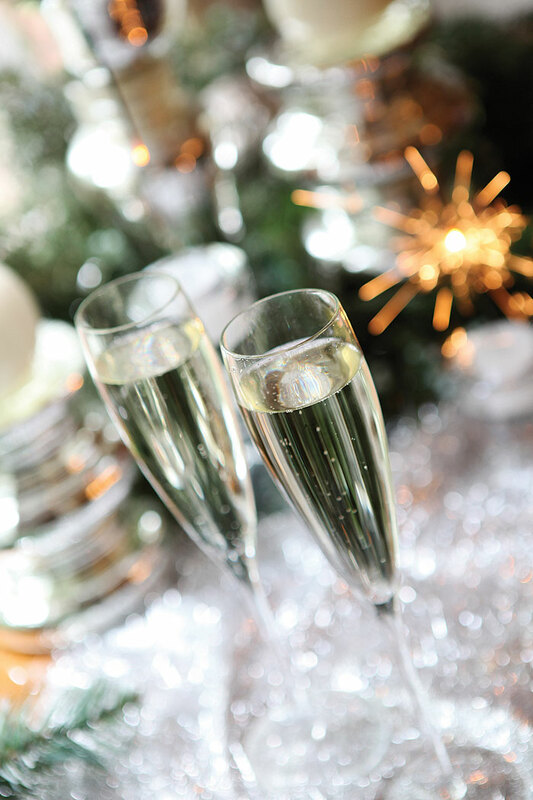 When speaking of the ultimate evening, however, the New Year’s Eve celebration holds the same rank as weddings, birthdays, and life’s other pivotal events. 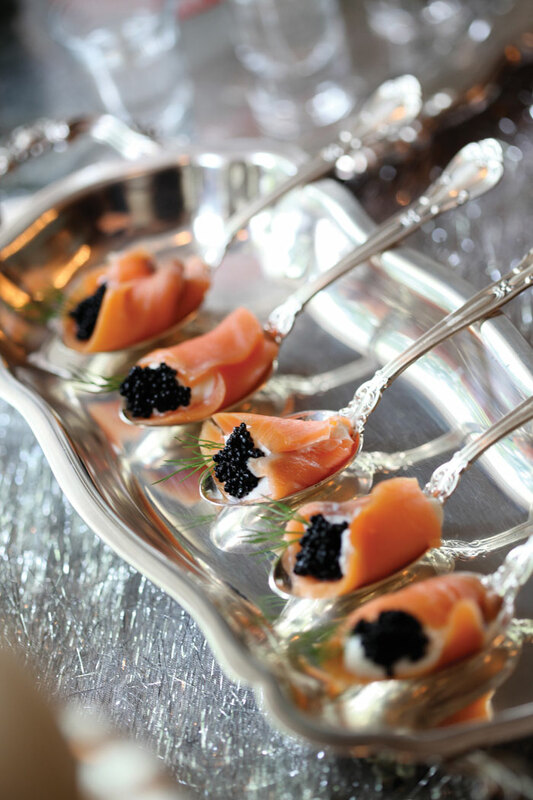 Smoked Salmon resting on silver spoons filled with sour cream, black caviar, and dill. Click here for the recipe. The festivities generally start well into the evening to ensure that everyone has the opportunity to stay until midnight. 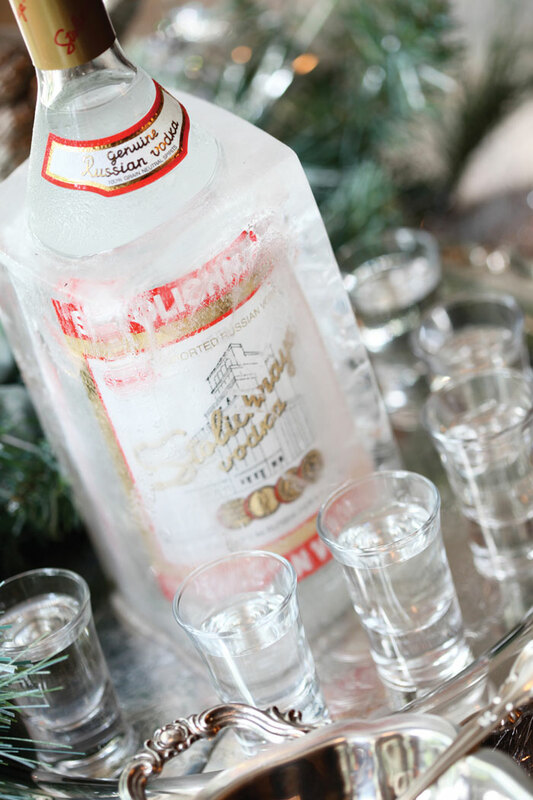 The celebration always starts with a round of vodka which can only be drunk after a toast regaling the past year. For the remainder of the evening, toasts are continuous, as many as 10, 15, or even 20, depending on the number of guests. Many toasts are poetic and beautiful while others are blessings bestowed upon the host, and of course humor is always appreciated. (Above) Vodka bottle frozen in a milk carton filled with water. Once the milk carton is removed, the vodka sits all evening in a chilled block of ice. Everyone of legal drinking age has a ryumochka (small shot glass) for vodka — no exceptions! 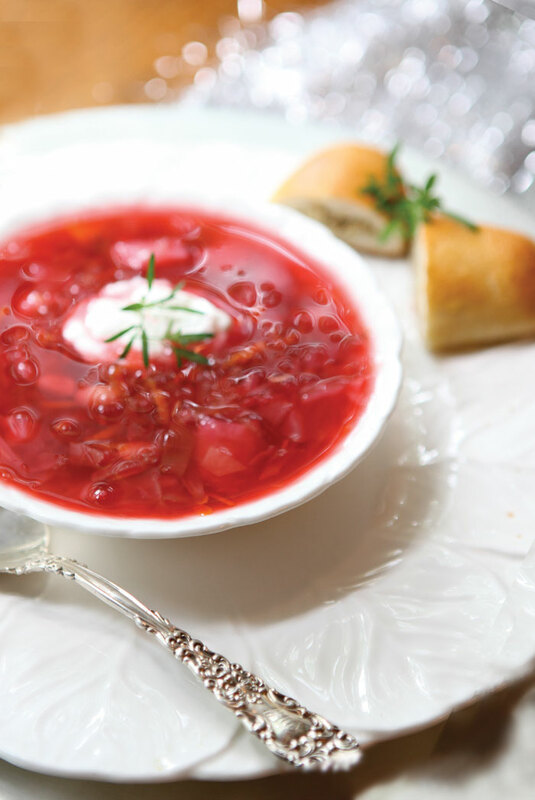 After a quick swig of the signature Russian drink, the guests enjoy a plentiful selection of zakuski (appetizers or “little bites”). Zakuski include mostly cold foods such as bread, cold cuts, cold and pickled fish, thick salads, pickled vegetables, and much more. 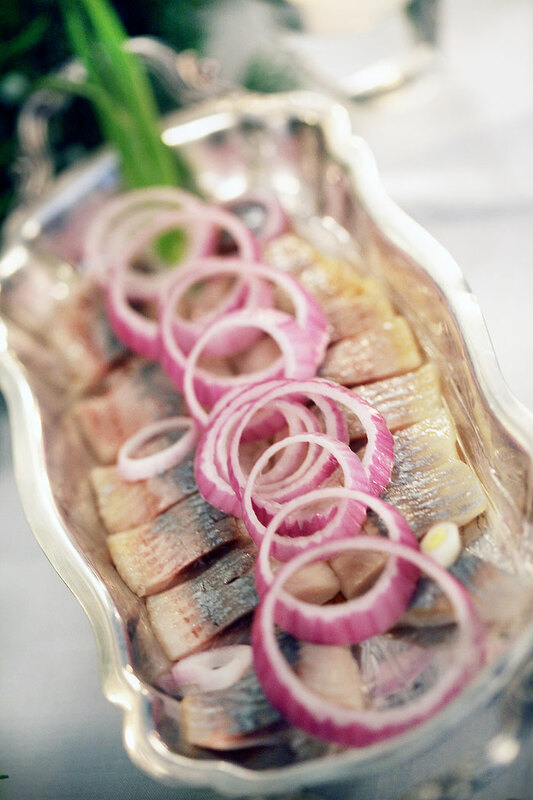 (Above) Salted Herring – A traditional Russian appetizer. Click here for the recipe. 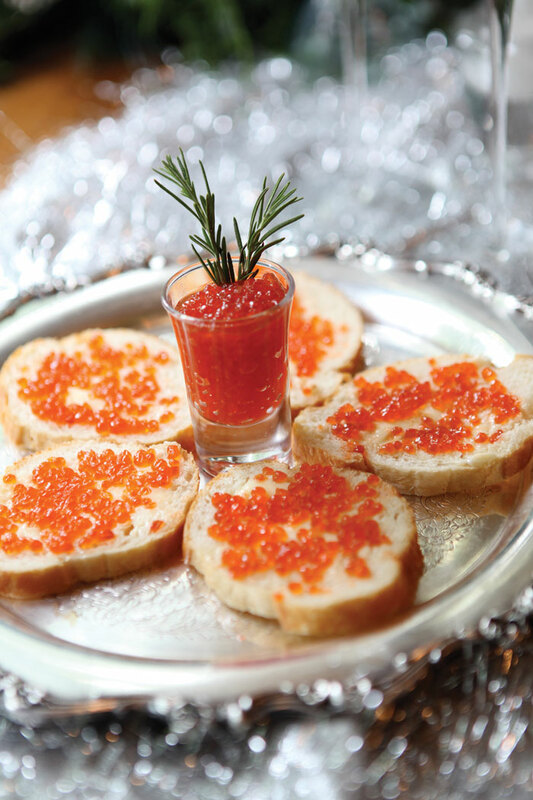 Delicious Russian Red Caviar Crostini…. perfect with vodka or champagne! Click here for the recipe. 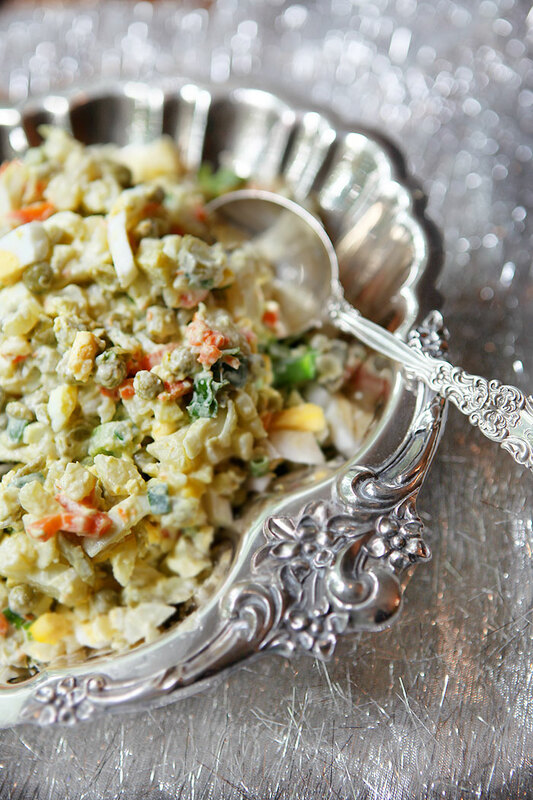 The ultimate Russian Potato Salad – Salad Olivier. Served at practically any Russian party! Click here to get the recipe. 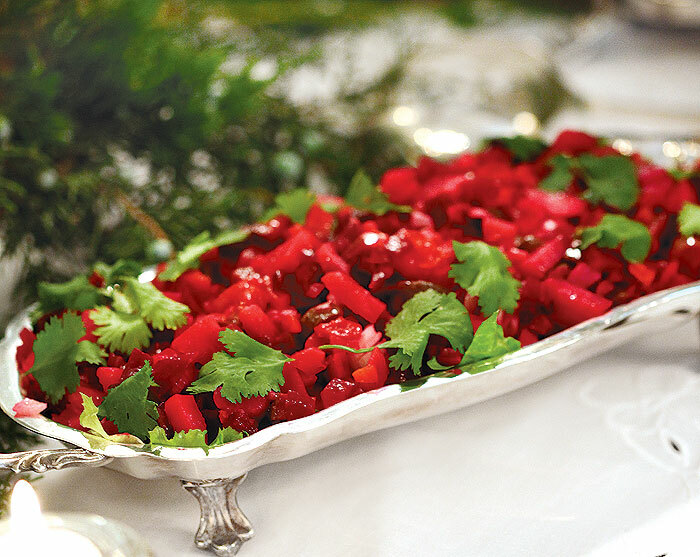 Another Russian favorite – Russian Vinaigrette Salad (Salad Vinegret). Beautiful and DELICIOUS!!! Click here for the recipe. 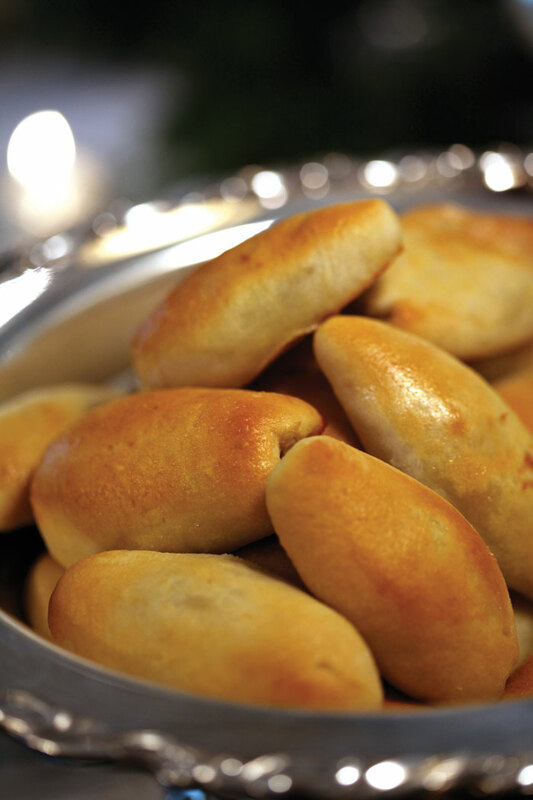 No Russian party would be complete without these delicious Pirozhki! Vtoroye (main course, literally “second” to the zakuski), consists of delicious hot foods, such as succulent meats, potatoes, fish, rice, dumplings, and hot vegetables. Dessert brings out another deeply-rooted Russian custom, drinking chai (dark tea) with delicious pastries. At midnight, everyone toasts each other with a glass of only the finest champagne. As can be imagined, one cannot consume a meal of this magnitude quickly, so it is not surprising that a Russian New Year’s feast can last five, six, seven hours or even longer. In some cases, guests return the following day to start the party all over again, a polite way of helping the hosts not to be burdened with maintaining the leftovers.